Bot Bash Party | Remote Controlled Battle Robots! At Your Next Birthday Party! Bot Bash is a truly unique experience for any special occasion. A Bot Bash is a fun and educational alternative to a traditional birthday party or celebration. Kids (and adults!) will have a ball battling each other with remote controlled robots. And parents will appreciate the educational value a Bot Bash brings. A Bot Bash is an unforgettable experience! 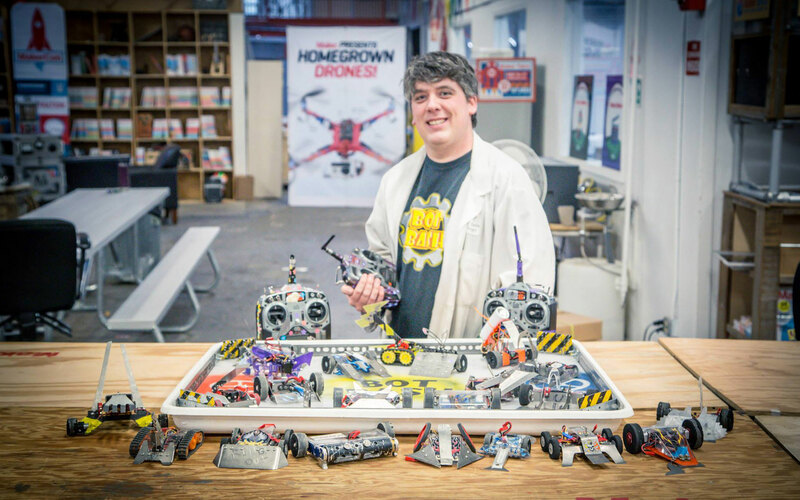 A robot fighting veteran will bring an arena along with four miniature robots and will hold a bracket-style tournament for a group of children (or adults!) to compete in. Each robot is equipped with a different weapon to get a wide variety of fighting styles. The technician on-hand will be available to answer any of your questions about robot fighting and to repair any damage done during your tournament.